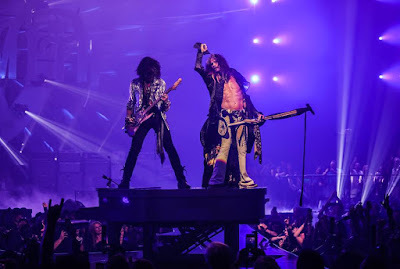 Aerosmith opened their Deuces Are Wild Las Vegas residency at the Park MGM's Park Theater on April 6. Aerosmith made it clear, right up front, that they’d be doing Vegas on their terms. “It’s a treat to see a band so accustomed to stadiums playing in a comparatively small 5,200-seat theater,” writes reviewer Tim Molloy. “At some points the show felt like visiting a friend’s basement to go over some old favorites, warmed by the soft hum of an amplifier. Before the group took the stage, the show began with a half-hour film that went deep into the band’s history. Aerosmith will perform 8 more Deuces Are Wild shows this month; they’ll return for more dates in June and July before playing a mini-series of US East Coast performances in August and resuming the Vegas run in the fall.